Create more space beneath your television. 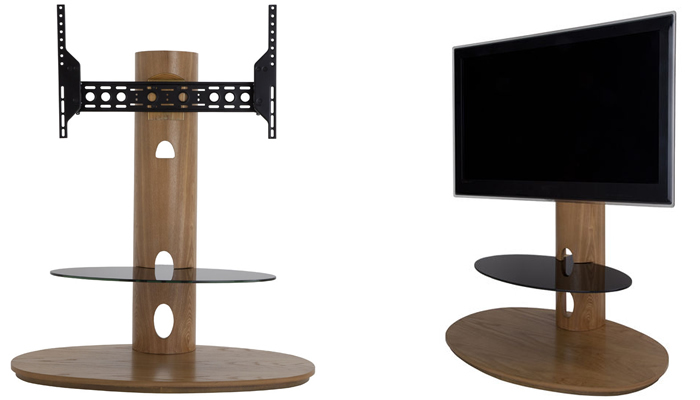 Create more space underneath your TV by mounting it onto a stand that also has a bracket. You can place a long soundbar beneath or simply decorate the area with some ornaments. 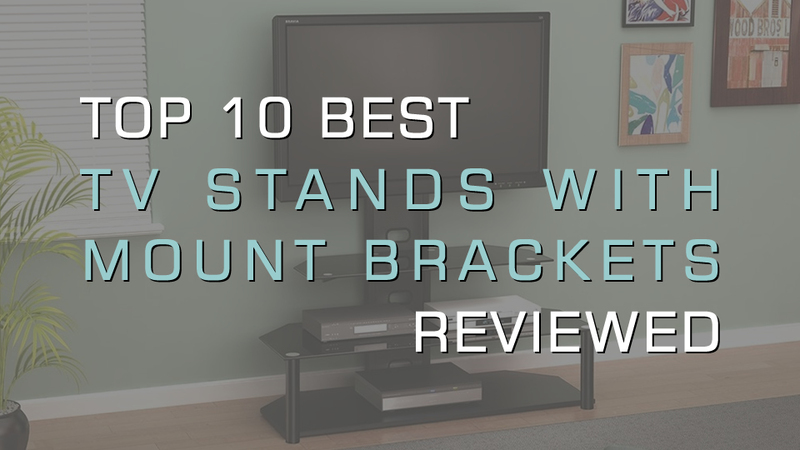 Choose from our top 10 best TV stands with mount brackets where design and stability blend well together. Creating an illusion of floating shelves, the Techlink Echo EC130TVB tv stand brings elegance into your lounge without looking bulky. 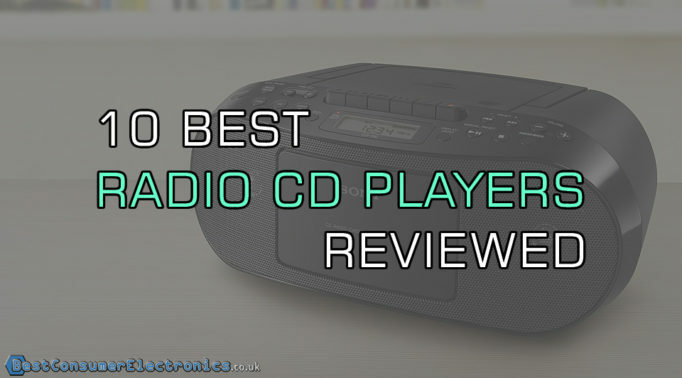 There is a good amount of storage space for display items, CDs and DVDs with the six shelves, a smooth glide drawer and a bracket that can hold any television up to 60 inches. Completing the look is its satin / gloss finish and keeping to the style, cables can be hidden with the integrated cable management. 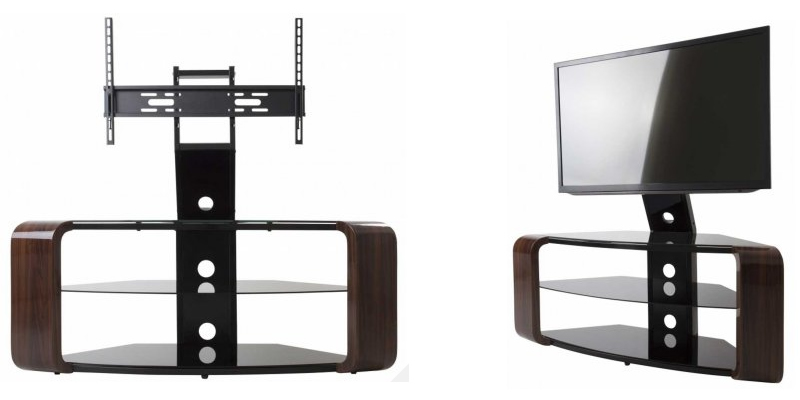 Made from manufactured wood and glass, this Curve TV Stand by Jual is finished with a beautiful brown sheen to give the stand a sophisticated and contemporary style. Within its curved design, there is one open shelf which is spacious enough for consoles and media players. The mounting bracket is fitted quite high to give plenty of space underneath to store more items on the shelf too. 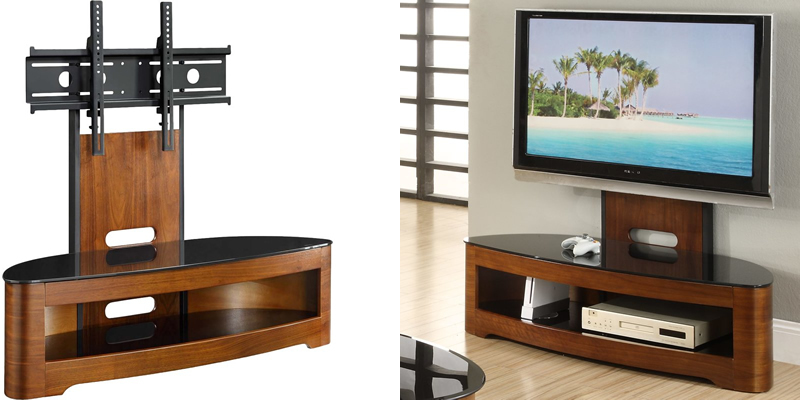 For a no nonsense TV stand, the AVF Combined TV stand fits that bill perfectly. Its simple black tempered glass design is sleek and stylish enough to suit almost any room design and offers plenty of cable tidy management with its three cable tidy holes. With the two shelves and along with the ability to hold a television up to 65 inches, this stand is perfect to use as a gaming station. To make the most of your viewing pleasure, the Sonorous TV and Media Stand has a column that leans forward graciously at a 45 degree angle. More than just a column, cables can be tidied and hidden inside from the back of your mounted TV. This gives the complete look of a modern and minimalist style. Made from aluminium, the stand is sturdy and can hold LCD / plasma TVs of up to 50 inches which is more than enough for the whole family to watch in comfort. Constructed from wood veneer and finished in a gorgeous walnut colour, the AVF Blenheim has a traditional and charming style about it. Featuring a curved and oval shaped design, this TV stand can be used in the corner of a room or flat against the wall. The construction is solid which can hold TVs up to 65 inches. 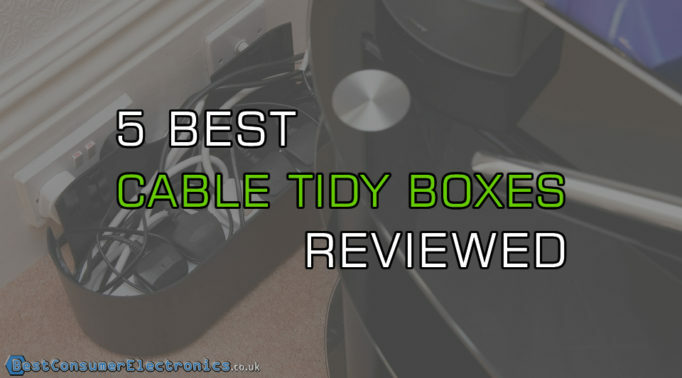 There are cable tidy holes that has been placed strategically for the mounted TV, within the open shelf for game consoles or media players and also inside the cabinet. Having doors on the cabinet is pretty handy for hiding away clutter too so it gives your entertainment area a more clean cut look. 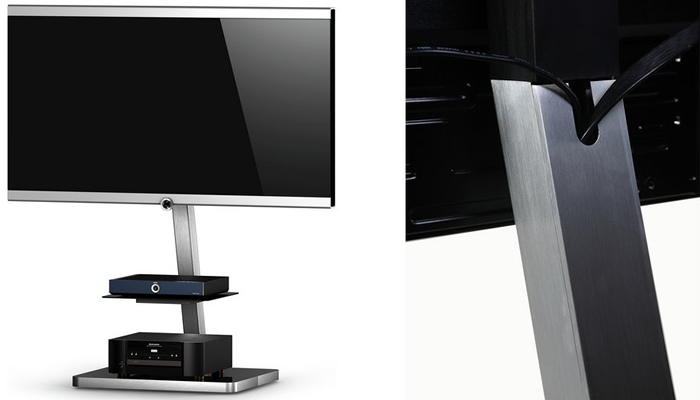 Featuring angled sides, the AVF Como TV stand is perfect to be placed in the corner of a room. Designed with a high gloss walnut and piano black safety glass shelves, this stand has lots of room for everything. There’s a total of three shelves and the higher the TV is mounted, the more room there is on the top shelf. A curved TV would look great mounted on this curved TV stand. The Off The Wall Origin II S4 Stand is compact and designed to fit in the corner or sit flush against the wall. It comes in two colours of oak and silver or black and walnut for a modern or traditional style home. 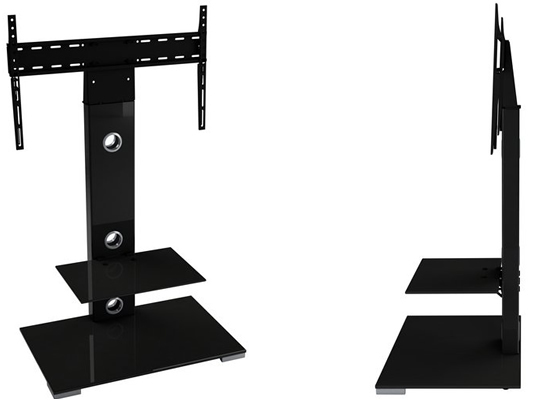 This stand has the convenience of a mount bracket for a soundbar and the height of the brackets can be adjusted or swivelled to a 20 degree angle for maximum viewing pleasure. Combined with the three shelves, this makes it perfect for use as a home cinema system. 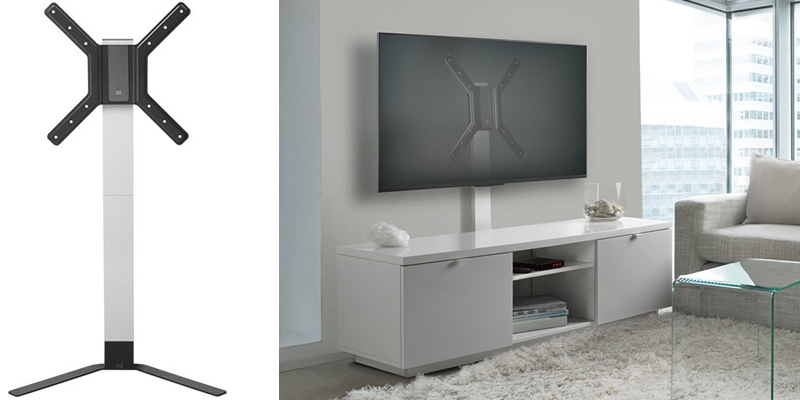 With the same features as the previous TV stand, the difference with this Off The Wall Motion TV & Soundbar Stand is the material and colours it’s available in. Made from glass of high quality and toughened, this stand is heavier and comes in all black or all silver for a futuristic or super modern look. To give it more stability, the base is made extra wide as well. 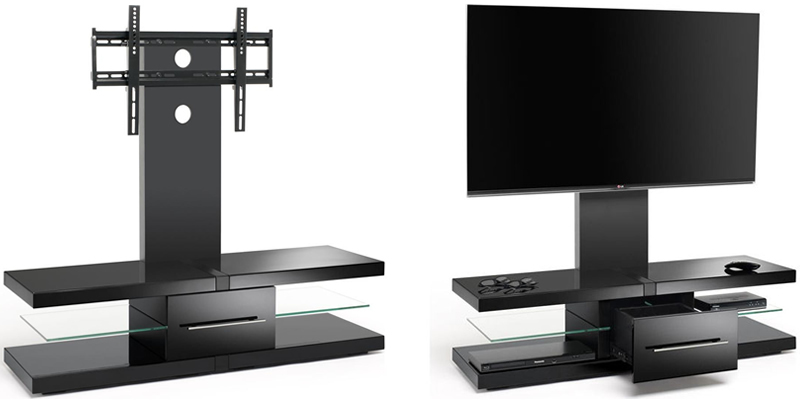 One of the latest generations of TV stands is the One For All Ultra Slim TV Stand which is simple to assemble without the need for tools or drilling. It looks worryingly thin and flimsy but in fact is very stable against the wall. TVs up to 60 inches can be fitted on and the stand can hold the weight up to 50kg. There are no shelves but the simplicity of the stand is great to be used as part of a home cinema system. 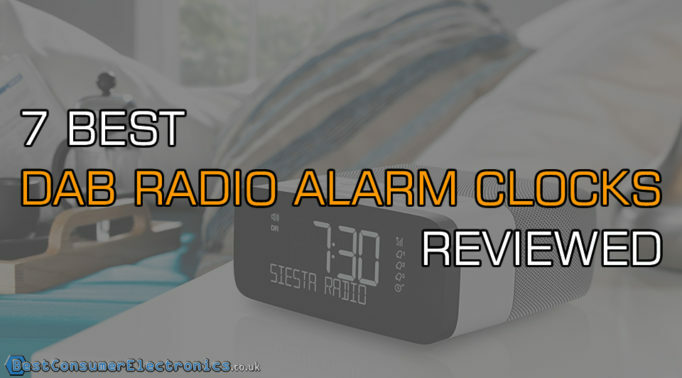 The design is stylish and will suit a home filled with gadgets and modern technology. Made from wood veneer and glass, the AVF Chepstow TV Stand is one of the best TV stands with mount brackets for the thick built-in cable management column. Not only is it wide enough to fit all the cables for game consoles, the TV and other peripherals, but it also gives the stand extra stability. 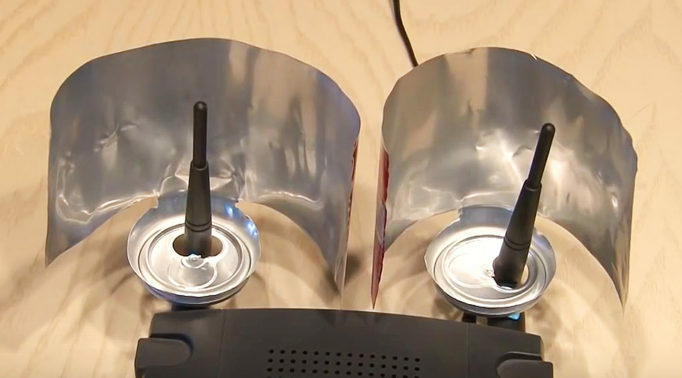 The perfect angle for viewing can be adjusted with the fingertip adjustment which can tilt up to 18 degrees as well.